The graphics display resolution is the width and height dimension of an electronic visual display device, such as a computer monitor, in pixels. Certain combinations of width and height are standardized and typically given a name and an initialism that is descriptive of its dimensions. A higher display resolution in a display of the same size means that displayed photo or video content appears sharper, and pixel art appears smaller. nHD is a display resolution of 640 × 360 pixels, which is exactly one ninth of a Full HD (1080p) frame and one quarter of a HD (720p) frame. Pixel doubling (vertically and horizontally) nHD frames will form one 720p frame and pixel tripling nHD frames will form one 1080p frame. One drawback of this resolution is that the vertical resolution is not an even multiple of 16, which is a common macroblock size for video codecs. Video frames encoded with 16×16 pixel macroblocks would be padded to 640 × 368 and the added pixels would be cropped away at playback. H.264 codecs have this padding and cropping ability built-in as standard. The same is true for qHD and 1080p but the relative amount of padding is more for lower resolutions such as nHD. qHD is a display resolution of 960 × 540 pixels, which is exactly one quarter of a Full HD (1080p) frame, in a 16:9 aspect ratio. Similar to DVGA, this resolution became popular for high-end smartphone displays in early 2011. Mobile phones including the Jolla, Sony Xperia C, HTC Sensation, Motorola Droid RAZR, LG Optimus L9, Microsoft Lumia 535 and Samsung Galaxy S4 Mini have displays with the qHD resolution, as does the PlayStation Vita portable game system. The HD resolution of 1280 × 720 pixels stems from high-definition television (HDTV), where it originally used 60 frames per second. With its 16:9 aspect ratio it is exactly 2 times the width and 11/2 times the height of 4:3 VGA, which shares its aspect ratio and 480 line count with NTSC. HD therefore has exactly 3 times as many pixels as VGA. This resolution is often referred to as 720p, although the p (which stands for progressive scan and is important for transmission formats) is irrelevant for labeling digital display resolutions. In the mid 2000s, when the digital HD technology and standard debuted on the market, this type of resolution was very often and commonly referred to (both by the public and by the marketers) by its friendlier branded and certified name HD ready. 1280 × 1080 is the resolution of Panasonic's DVCPRO HD Format, as well as DV Camcorders using this format, and their TFT LCD screens. It has an aspect ratio of 32:27 (1.185:1), an approximate of Movietone Cameras of 1930's. In 2007, Hitachi released a few 42" and 50" television models at this resolution. Full HD or FHD is the resolution used by the 1080p and 1080i HDTV video formats. It has a 16:9 aspect ratio and 2,073,600 total pixels, and is exactly 50% larger than HD (1280 × 720) in each dimension for a total of 2.25 times as many pixels. Using interlacing, the bandwidth requirements are very similar to those of 720p at the same field rate. DCI 2K is a standardized format established by the Digital Cinema Initiatives consortium in 2005 for 2K video projection. This format has a resolution of 2048 × 1080 (2.2 megapixels) with an aspect ratio of 256:135 (1.8962:1). This is the native resolution for DCI-compliant 2K digital projectors and displays. 2160 × 1080 is a resolution used by many smartphones since 2018. It has an aspect ratio of 18:9, matching that of the Univisium film format. Some smartphones have 2340 x 1080, referred to as "FHD+". This resolution is equivalent to a Full HD (1920 × 1080) extended in width by 33%, with an aspect ratio of 64:27. It is sometimes referred to as "1080p ultrawide" or "UW-FHD" (ultrawide FHD). Monitors at this resolution usually contain built in firmware to divide the screen into two 1280 × 1080 screens. QHD (Quad HD), WQHD (Wide Quad HD), or 1440p, is a display resolution of 2560 × 1440 pixels in a 16:9 aspect ratio. The name QHD reflects the fact that it has four times as many pixels as HD (720p). It is also commonly called WQHD, to emphasize it being a wide resolution, although that is technically unnecessary, since the HD resolutions are all wide. One advantage of using "WQHD" is avoiding confusion with qHD with a small q (960 × 540). In October 2006, Chi Mei Optoelectronics (CMO) announced a 47-inch 1440p LCD panel to be released in Q2 2007; the panel was planned to finally debut at FPD International 2008 in a form of autostereoscopic 3D display. As of the end of 2013, monitors with this resolution are becoming more common. A list of monitors with QHD resolution is available. The resolution is also used in portable devices. In September 2012, Samsung announced the Series 9 WQHD laptop with a 13-inch 2560 × 1440 display. In August 2013, LG announced a 5.5-inch QHD smartphone display, which was used in the LG G3. In October 2013 Vivo announced a smartphone with a 2560 × 1440 display. Other phone manufacturers followed in 2014, such as Samsung with the Galaxy Note 4, and Google and Motorola with the Nexus 6 smartphone. By the mid 2010s, it was a common resolution among flagship phones such as the HTC 10, the Lumia 950, and the Galaxy S6 and S7. This resolution has a 16:9 aspect ratio, and is exactly four times as many pixels as the 1600 × 900 HD+ resolution. It has been referred to as "WQXGA+", "QHD" and "QHD+" by various different companies. This resolution is equivalent to QHD (2560 × 1440) extended in width by 34%, giving it an aspect ratio of 43:18 (2.38:1, or 21.5:9; commonly marketed as simply "21:9"). The first monitor to support this resolution was the 34-inch LG 34UM95-P. LG uses the term "UW-QHD" to describe this resolution. This monitor was first released in Germany in late December 2013, before being officially announced at CES 2014. The first products announced to use this resolution were the 2013 HP Envy 14 TouchSmart Ultrabook and the 13.3-inch Samsung Ativ Q. This resolution is equivalent to two Full HD (1920 × 1080) displays side-by-side, or one vertical half of a 4K UHD (3840 × 2160) display. It has an aspect ratio of 32:9 (3.55:1), close to the 3.6:1 ratio of IMAX UltraWideScreen 3.6. Samsung monitors at this resolution contain built in firmware to divide the screen into two 1920 × 1080 screens, or one 2560 × 1080 and one 1280 × 1080 screen. This resolution has a 12:5 aspect ratio (2.4:1, or 21.6:9). It is equivalent to WQXGA (2560 × 1600) extended in width by 50%, or 4K UHD (3840 × 2160) reduced in height by 26%. This resolution is commonly encountered in cinematic 4K content that has been cropped vertically to a widescreen 2.4:1 aspect ratio. The first monitor to support this resolution was the 37.5-inch LG 38UC99-W. Other vendors followed, with Dell U3818DW, HP Z38c, and Acer XR382CQK. This resolution is referred to as UW4K, WQHD+, UWQHD+, or QHD+, though no single name is agreed upon. This resolution, sometimes referred to as 4K UHD or 4K × 2K, has a 16:9 aspect ratio and 8,294,400 pixels. It is double the size of Full HD (1920 × 1080) in both dimensions for a total of four times as many pixels, and triple the size of HD (1280 × 720) in both dimensions for a total of nine times as many pixels. 3840 × 2160 was chosen as the resolution of the UHDTV1 format defined in SMPTE ST 2036-1, as well as the 4K UHDTV system defined in ITU-R BT.2020 and the UHD-1 broadcast standard from DVB. It is also the minimum resolution requirement for CEA's definition of an Ultra HD display. Prior to the publication of these standards, it was sometimes casually referred to as "QFHD" (Quad Full HD). In 2015 Sony announced the Xperia Z5 Premium, the first smartphone with a 4K display, and in 2017 Sony announced the Xperia XZ Premium, the first smartphone with a 4K HDR display. 4096 × 2160, referred to as DCI 4K, Cinema 4K or 4K × 2K, is the resolution used by the 4K container format defined by the Digital Cinema Initiatives Digital Cinema System Specification, a prominent standard in the cinema industry. This resolution has an aspect ratio of 256:135 (1.8962:1), and 8,847,360 total pixels. This is the native resolution for DCI 4K digital projectors and displays. This resolution is equivalent to 4K UHD (3840 × 2160) extended in width by 33%, giving it a 64:27 aspect ratio (≈21:9) and 11,059,200 total pixels. It is exactly double the size of 2560 × 1080 in both dimensions, for a total of four times as many pixels. The first displays to support this resolution were 105-inch televisions, the LG 105UC9 and the Samsung UN105S9W. In December 2017, LG announced a 34-inch 5120 × 2160 monitor, the 34WK95U. LG refers to this resolution as "5K2K WUHD". This resolution, commonly referred to as 5K or 5K × 3K, has a 16:9 aspect ratio and 14,745,600 pixels. Although it is not established by any of the UHDTV standards, some manufacturers such as Dell have referred to it as UHD+. It is exactly double the pixel count of QHD (2560 × 1440) in both dimensions for a total of four times as many pixels, and is 33% larger than 4K UHD (3840 × 2160) in both dimensions for a total of 1.77 times as many pixels. The line count of 2880 is also the least common multiple of 480 and 576, the scanline count of NTSC and PAL, respectively. Such a resolution can vertically scale SD content to fit by natural numbers (6 for NTSC and 5 for PAL). Horizontal scaling of SD is always fractional (non-anamorphic: 5.33...5.47, anamorphic: 7.11...7.29). The first display with this resolution was the Dell UltraSharp UP2715K, announced on September 5, 2014. On October 16, 2014, Apple announced the iMac with Retina 5K display. This resolution, sometimes referred to as 8K UHD, has a 16:9 aspect ratio and 33,177,600 pixels. It is exactly double the size of 4K UHD (3840 × 2160) in each dimension for a total of four times as many pixels, and quadruple the size of Full HD (1920 × 1080) in each dimension for a total of sixteen times as many pixels. 7680 × 4320 was chosen as the resolution of the UHDTV2 format defined in SMPTE ST 2036-1, as well as the 8K UHDTV system defined in ITU-R BT.2020 and the UHD-2 broadcast standard from DVB. Half-QVGA denotes a display screen resolution of 240 × 160 or 160 × 240 pixels, as seen on the Game Boy Advance. This resolution is half of QVGA, which is itself a quarter of VGA, which is 640 × 480 pixels. The Quarter Video Graphics Array (also known as Quarter VGA, QVGA, or qVGA) is a popular term for a computer display with 320 × 240 display resolution that debuted with the CGA Color Graphics Adapter for the original IBM PC. QVGA displays were most often used in mobile phones, personal digital assistants (PDA), and some handheld game consoles. Often the displays are in a "portrait" orientation (i.e., taller than they are wide, as opposed to "landscape") and are referred to as 240 × 320. The name comes from having a quarter of the 640 × 480 maximum resolution of the original IBM VGA display technology, which became a de facto industry standard in the late 1980s. QVGA is not a standard mode offered by the VGA BIOS, even though VGA and compatible chipsets support a QVGA-sized Mode X. The term refers only to the display's resolution and thus the abbreviated term QVGA or Quarter VGA is more appropriate to use. QVGA resolution is also used in digital video recording equipment as a low-resolution mode requiring less data storage capacity than higher resolutions, typically in still digital cameras with video recording capability, and some mobile phones. Each frame is an image of 320 × 240 pixels. QVGA video is typically recorded at 15 or 30 frames per second. QVGA mode describes the size of an image in pixels, commonly called the resolution; numerous video file formats support this resolution. While QVGA is a lower resolution than VGA, at higher resolutions the "Q" prefix commonly means quad(ruple) or four times higher display resolution (e.g., QXGA is four times higher resolution than XGA). To distinguish quarter from quad, lowercase "q" is sometimes used for "quarter" and uppercase "Q" for "quad", by analogy with SI prefixes like m/M and p/P, but this is not a consistent usage. Some examples of devices that use QVGA display resolution include, Samsung i5500, LG Optimus L3-E400, Galaxy Fit, Y and Pocket, HTC Wildfire, Sony Ericsson Xperia X10 Mini and mini pro and Nintendo 3DS' bottom screen. 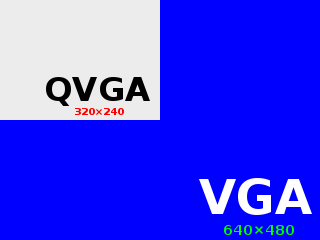 Wide QVGA or WQVGA is any display resolution having the same height in pixels as QVGA, but wider. This definition is consistent with other 'wide' versions of computer displays. Since QVGA is 320 pixels wide and 240 pixels high (aspect ratio of 4:3), the resolution of a WQVGA screen might be 360 × 240 (3:2 aspect ratio), 384 × 240 (16:10 aspect ratio), 400 × 240 (5:3 – such as the Nintendo 3DS screen or the maximum resolution in YouTube at 240p), 428 × 240 (≈16:9 ratio) or 432 × 240 (18:10 aspect ratio). As with WVGA, exact ratios of n:9 are difficult because of the way VGA controllers internally deal with pixels. For instance, when using graphical combinatorial operations on pixels, VGA controllers will use 1 bit per pixel. Since bits cannot be accessed individually but by chunks of 16 or an even higher power of 2, this limits the horizontal resolution to a 16-pixel granularity, i.e., the horizontal resolution must be divisible by 16. In the case of 16:9 ratio, with 240 pixels high, the horizontal resolution should be 240 / 9 × 16 = 426.6, the closest multiple of 16 is 432. WQVGA has also been used to describe displays that are not 240 pixels high, for example Sixteenth HD1080 displays which are 480 pixels wide and 270 or 272 pixels high. This may be due to WQVGA having the nearest screen height. WQVGA resolutions were commonly used in touchscreen mobile phones, such as 400 × 240, 432 × 240, and 480 × 240. For example, the Hyundai MB 490i, Sony Ericsson Aino and the Samsung Instinct have WQVGA screen resolutions – 240 × 432. Other devices such as the Apple iPod Nano also use a WQVGA screen, 240 × 376 pixels. HVGA (Half-size VGA) screens have 480 × 320 pixels (3:2 aspect ratio), 480 × 360 pixels (4:3 aspect ratio), 480 × 272 (≈16:9 aspect ratio), or 640 × 240 pixels (8:3 aspect ratio). The former is used by a variety of PDA devices, starting with the Sony CLIÉ PEG-NR70 in 2002, and standalone PDAs by Palm. The latter was used by a variety of handheld PC devices. VGA resolution is 640 × 480. Examples of devices that use HVGA include the Apple iPhone (1st generation through 3GS), BlackBerry Bold 9000, HTC Dream, Hero, Wildfire S, LG GW620 Eve, MyTouch 3G Slide, Nokia 6260 Slide, Palm Pre, Samsung M900 Moment, Sony Ericsson Xperia X8, mini, mini pro, active and live and the Sony PlayStation Portable. Texas Instruments produces the DLP pico projector which supports HVGA resolution. HVGA was the only resolution supported in the first versions of Google Android, up to release 1.5. Other higher and lower resolutions became available starting on release 1.6, like the popular WVGA resolution on the Motorola Droid or the QVGA resolution on the HTC Tattoo. Three-dimensional computer graphics common on television throughout the 1980s were mostly rendered at this resolution, causing objects to have jagged edges on the top and bottom when edges were not anti-aliased. Video Graphics Array (VGA) refers specifically to the display hardware first introduced with the IBM PS/2 line of computers in 1987. Through its widespread adoption, VGA has also come to mean either an analog computer display standard, the 15-pin D-subminiature VGA connector, or the 640 × 480 resolution itself. While the VGA resolution was superseded in the personal computer market in the 1990s, it became a popular resolution on mobile devices in the 2000s. VGA is still the universal fallback troubleshooting mode in the case of trouble with graphic device drivers in operating systems. In the field of videos the resolution of 640 × 480 is called Standard Definition (SD), in comparison for instance to HD (1280 × 720) or Full HD (1920 × 1080). Wide VGA or WVGA, sometimes just WGA, an abbreviation for Wide Video Graphics Array is any display resolution with the same 480 pixel height as VGA but wider, such as 720 × 480 (3:2 aspect ratio), 800 × 480 (5:3), 848 × 480, 852 × 480, 853 × 480, or 854 × 480 (≈16:9). It is a common resolution among LCD projectors and later portable and hand-held internet-enabled devices (such as MID and Netbooks) as it is capable of rendering web sites designed for an 800 wide window in full page-width. Examples of hand-held internet devices, without phone capability, with this resolution include: Spice stellar nhance mi-435, ASUS Eee PC 700 series, Dell XCD35, Nokia 770, N800, and N810. Mobile phones with WVGA display resolution are also common. A list of mobile phones with WVGA display is available. FWVGA is an abbreviation for Full Wide Video Graphics Array which refers to a display resolution of 854 × 480 pixels. 854 × 480 is approximately the 16:9 aspect ratio of anamorphically "un-squeezed" NTSC DVD widescreen video and considered a "safe" resolution that does not crop any of the image. It is called Full WVGA to distinguish it from other, narrower WVGA resolutions which require cropping 16:9 aspect ratio high-definition video (i.e. it is full width, albeit with considerable reduction in size). In 2010, mobile phones with FWVGA display resolution started to become more common. A list of mobile phones with FWVGA displays is available. In addition, the Wii U GamePad that comes with the Nintendo Wii U gaming console includes a 6.2-inch FWVGA display. Super Video Graphics Array, abbreviated to Super VGA or SVGA, also known as Ultra Video Graphics Array, abbreviated to Ultra VGA or UVGA, is a broad term that covers a wide range of computer display standards. Originally, it was an extension to the VGA standard first released by IBM in 1987. Unlike VGA – a purely IBM-defined standard – Super VGA was defined by the Video Electronics Standards Association (VESA), an open consortium set up to promote interoperability and define standards. When used as a resolution specification, in contrast to VGA or XGA for example, the term SVGA normally refers to a resolution of 800 × 600 pixels. The marginally higher resolution 832 × 624 is the highest 4:3 resolution not greater than 219 pixels, with its horizontal dimension a multiple of 32 pixels. This enables it to fit within a framebuffer of 512 KB (512 × 210 bytes), and the common multiple of 32 pixels constraint is related to alignment. For these reasons this resolution was available on the Macintosh LC III and other systems. Examples of devices that use DVGA include the Meizu MX mobile phone and the Apple iPhone 4/4S, where the screen is called the "Retina Display". The wide version of SVGA is known as WSVGA (Wide Super VGA), featured on Ultra-Mobile PCs, netbooks, and tablet computers. The resolution is either 1024 × 576 (aspect ratio 16:9) or 1024 × 600 (between 15:9 and 16:9) with screen sizes normally ranging from 7 to 10 inches. It has full XGA width of 1024 pixels. The Extended Graphics Array (XGA) is an IBM display standard introduced in 1990. Later it became the most common appellation of the 1024 × 768 pixels display resolution, but the official definition is broader than that. It was not a new and improved replacement for Super VGA, but rather became one particular subset of the broad range of capabilities covered under the "Super VGA" umbrella. 640 × 480 pixels in direct 16 bits-per-pixel (65,536 color) RGB hi-color (XGA only, with 1 MB video memory option) and 8 bpp (256 color) palette-indexed mode. Like the 8514, XGA offered fixed function hardware acceleration to offload processing of 2D drawing tasks. Both adapters allowed offloading of line-draw, bitmap-copy (bitblt), and color-fill operations from the host CPU. XGA's acceleration was faster than 8514's, and more comprehensive, supporting more drawing primitives, the VGA-res hi-color mode, versatile "brush" and "mask" modes, system memory addressing functions, and a single simple hardware sprite typically used to providing a low CPU load mouse pointer. It was also capable of wholly independent function, as it incorporated support for all existing VGA functions and modes – the 8514 itself was a simpler add-on adapter that required a separate VGA to be present. It should be noted that, as they were designed for use with IBM's own range of fixed-frequency monitors, neither adapter offered support for 800 × 600 SVGA modes. XGA-2 added a 24-bit DAC, but this was used only to extend the available master palette in 256-color mode, e.g. to allow true 256-greyscale output instead of the 64 grey levels previously available; there was still no direct True Color mode despite the adapter featuring enough default onboard VRAM (1 MB) to support it. Other improvements included provision of the previously missing 800 × 600 resolution (using an SVGA or multisync monitor) in up to 65,536 colors, faster screen refresh rates in all modes (including non-interlace, flicker-free output for 1024 × 768), and improved accelerator performance and versatility. All standard XGA modes have a 4:3 aspect ratio with square pixels, although this does not hold for certain standard VGA and third-party extended modes (640 × 400, 1280 × 1024). XGA should not be confused with EVGA (Extended Video Graphics Array), a contemporaneous VESA standard that also has 1024 × 768 pixels. It should also not be confused with the Expanded Graphics Adapter, a peripheral for the IBM 3270 PC which can also be referred to as XGA. Wide Extended Graphics Array (Wide XGA or WXGA) is a set of non standard resolutions derived from the XGA display standard by widening it to a wide screen aspect ratio. WXGA is commonly used for low-end LCD TVs and LCD computer monitors for widescreen presentation. The exact resolution offered by a device described as "WXGA" can be somewhat variable owing to a proliferation of several closely related timings optimised for different uses and derived from different bases. In 2006, 1366 × 768 was the most popular resolution for liquid crystal display televisions (versus XGA for Plasma TVs flat panel displays);[not in citation given] by 2013, even this was relegated to only being used in smaller or cheaper displays (e.g. "bedroom" LCD TVs, or low-cost, large-format plasmas), cheaper laptop and mobile tablet computers, and midrange home cinema projectors, having otherwise been overtaken by higher "full HD" resolutions such as 1920 × 1080. Widespread availability of 1280 × 800 and 1366 × 768 pixel resolution LCDs for laptop monitors can be considered an OS-driven evolution from the formerly popular 1024 × 768 screen size, which has itself since seen UI design feedback in response to what could be considered disadvantages of the widescreen format when used with programs designed for "traditional" screens. In Microsoft Windows operating system specifically, the larger task bar of Windows Vista and 7 occupies an additional 16 pixel lines by default, which may compromise the usability of programs that already demanded a full 1024 × 768 (instead of, e.g. 800 × 600) unless it is specifically set to use small icons; an "oddball" 784-line resolution would compensate for this, but 1280 × 800 has a simpler aspect and also gives the slight bonus of 16 more usable lines. Also, the Windows Sidebar in Windows Vista and 7 can use the additional 256 or 336 horizontal pixels to display informational "widgets" without compromising the display width of other programs, and Windows 8 is specifically designed around a "two pane" concept where the full 16:9 or 16:10 screen is not required. Typically, this consists of a 4:3 main program area (typically 1024 × 768, 1000 × 800 or 1440 × 1080) plus a narrow sidebar running a second program, showing a toolbox for the main program or a pop-out OS shortcut panel taking up the remainder. Some 1440 × 900 resolution displays have also been found labeled as WXGA; however, the correct label is actually WSXGA or WXGA+. XGA+ stands for Extended Graphics Array Plus and is a computer display standard, usually understood to refer to the 1152 × 864 resolution with an aspect ratio of 4:3. Until the advent of widescreen LCDs, XGA+ was often used on 17-inch desktop CRT monitors. It is the highest 4:3 resolution not greater than 220 pixels (≈1.05 megapixels), with its horizontal dimension a multiple of 32 pixels. This enables it to fit closely into a video memory or framebuffer of 1 MB (1 × 220 bytes), assuming the use of one byte per pixel. The common multiple of 32 pixels constraint is related to alignment. Historically, the resolution also relates to the earlier standard of 1152 × 900 pixels, which was adopted by Sun Microsystems for the Sun-2 workstation in the early 1980s. A decade later, Apple Computer selected the resolution of 1152 × 870 for their 21-inch CRT monitors, intended for use as two-page displays on the Macintosh II computer. These resolutions are even closer to the limit of a 1 MB framebuffer, but their aspect ratios differ slightly from the common 4:3. Super Extended Graphics Array (SXGA) is a standard monitor resolution of 1280 × 1024 pixels. This display resolution is the "next step" above the XGA resolution that IBM developed in 1990. The 1280 × 1024 resolution is not the standard 4:3 aspect ratio, but 5:4 (1.25:1 instead of 1.333:1). A standard 4:3 monitor using this resolution will have rectangular rather than square pixels, meaning that unless the software compensates for this the picture will be distorted, causing circles to appear elliptical. SXGA is the most common native resolution of 17 inch and 19 inch LCD monitors. An LCD monitor with SXGA native resolution will typically have a physical 5:4 aspect ratio, preserving a 1:1 pixel aspect ratio. Sony manufactured a 17-inch CRT monitor with a 5:4 aspect ratio designed for this resolution. It was sold under the Apple brand name. SXGA is also a popular resolution for cell phone cameras, such as the Motorola Razr and most Samsung and LG phones. Although being taken over by newer UXGA (2.0-megapixel) cameras, the 1.3-megapixel was the most common around 2007. Any CRT that can run 1280 × 1024 can also run 1280 × 960, which has the standard 4:3 ratio. A flat panel TFT screen, including one designed for 1280 × 1024, will show stretching distortion when set to display any resolution other than its native one, as the image needs to be interpolated to fit in the fixed grid display. Some TFT displays do not allow a user to disable this, and will prevent the upper and lower portions of the screen from being used forcing a "letterbox" format when set to a 4:3 ratio. SXGA+ stands for Super Extended Graphics Array Plus and is a computer display standard. An SXGA+ display is commonly used on 14-inch or 15-inch laptop LCD screens with a resolution of 1400 × 1050 pixels. An SXGA+ display is used on a few 12-inch laptop screens such as the ThinkPad X60 and X61 (both only as tablet) as well as the Toshiba Portégé M200 and M400, but those are far less common. At 14.1 inches, Dell offered SXGA+ on many of the Dell Latitude "C" series laptops, such as the C640, and IBM since the ThinkPad T21 . Sony also used SXGA+ in their Z1 series, but no longer produce them as widescreen has become more predominant. WSXGA+ stands for Widescreen Super Extended Graphics Array Plus. WSXGA+ displays were commonly used on Widescreen 20-, 21-, and 22-inch LCD monitors from numerous manufacturers (and a very small number of 19-inch widescreen monitors), as well as widescreen 15.4-inch and 17-inch laptop LCD screens like the Thinkpad T61p, the late 17" Apple PowerBook G4 and the unibody Apple 15" MacBook Pro. The resolution is 1680 × 1050 pixels (1,764,000 pixels) with a 16:10 aspect ratio. WUXGA stands for Widescreen Ultra Extended Graphics Array and is a display resolution of 1920 × 1200 pixels (2,304,000 pixels) with a 16:10 screen aspect ratio. It is a wide version of UXGA, and can be used for viewing high-definition television (HDTV) content, which uses a 16:9 aspect ratio and a 1280 × 720 (720p) or 1920 × 1080 (1080i or 1080p) resolution. WUXGA resolution has a total of 2,304,000 pixels. An uncompressed 8-bit RGB WUXGA image has a size of 6.75 MB. As of 2014, this resolution is available in a few high-end LCD televisions and computer monitors (e.g. Dell Ultrasharp U2413, Lenovo L220x, Samsung T220P, ViewSonic SD-Z225, Asus PA248Q), although in the past it was used in a wider variety of displays, including 17-inch laptops. WUXGA use predates the introduction of LCDs of that resolution. Most QXGA displays support 1920 × 1200 and widescreen CRTs such as the Sony GDM-FW900 and Hewlett Packard A7217A do as well. WUXGA is also available in some of the more high end mobile phablet devices such as the Huawei Honor X2 Gem. The QXGA, or Quad Extended Graphics Array, display standard is a resolution standard in display technology. Some examples of LCD monitors that have pixel counts at these levels are the Dell 3008WFP, the Apple Cinema Display, the Apple iMac (27-inch 2009–present), the iPad (3rd generation), and the MacBook Pro (3rd generation). Many standard 21–22-inch CRT monitors and some of the highest-end 19-inch CRTs also support this resolution. QWXGA (Quad Wide Extended Graphics Array) is a display resolution of 2048 × 1152 pixels with a 16:9 aspect ratio. A few QWXGA LCD monitors were available in 2009 with 23- and 27-inch displays, such as the Acer B233HU (23-inch) and B273HU (27-inch), the Dell SP2309W, and the Samsung 2343BWX. As of 2011, most 2048 × 1152 monitors have been discontinued, and as of 2013 no major manufacturer produces monitors with this resolution. QXGA (Quad Extended Graphics Array) is a display resolution of 2048 × 1536 pixels with a 4:3 aspect ratio. The name comes from it having four times as many pixels as an XGA display. Examples of LCDs with this resolution are the IBM T210 and the Eizo G33 and R31 screens, but in CRT monitors this resolution is much more common; some examples include the Sony F520, ViewSonic G225fB, NEC FP2141SB or Mitsubishi DP2070SB, Iiyama Vision Master Pro 514, and Dell and HP P1230. Of these monitors, none are still in production. A related display size is WQXGA, which is a wide screen version. CRTs offer a way to achieve QXGA cheaply. Models like the Mitsubishi Diamond Pro 2045U and IBM ThinkVision C220P retailed for around US$200, and even higher performance ones like the ViewSonic PerfectFlat P220fB remained under $500. At one time, many off-lease P1230s could be found on eBay for under $150. The LCDs with WQXGA or QXGA resolution typically cost four to five times more for the same resolution. IDTech manufactured a 15-inch QXGA IPS panel, used in the IBM ThinkPad R50p. NEC sold laptops with QXGA screens in 2002–05 for the Japanese market. The iPad (starting from 3rd generation) also has a QXGA display. WQXGA (Wide Quad Extended Graphics Array) is a display resolution of 2560 × 1600 pixels with a 16:10 aspect ratio. The name comes from it being a wide version of QXGA and having four times as many pixels as an WXGA (1280 × 800) display. To obtain a vertical refresh rate higher than 40 Hz with DVI, this resolution requires dual-link DVI cables and devices. To avoid cable problems monitors are sometimes shipped with an appropriate dual link cable already plugged in. Many video cards support this resolution. One feature that is currently unique to the 30 inch WQXGA monitors is the ability to function as the centerpiece and main display of a three-monitor array of complementary aspect ratios, with two UXGA (1600 × 1200) 20-inch monitors turned vertically on either side. The resolutions are equal, and the size of the 1600 resolution edges (if the manufacturer is honest) is within a tenth of an inch (16-inch vs. 15.89999"), presenting a "picture window view" without the extreme lateral dimensions, small central panel, asymmetry, resolution differences, or dimensional difference of other three-monitor combinations. The resulting 4960 × 1600 composite image has a 3.1:1 aspect ratio. This also means one UXGA 20-inch monitor in portrait orientation can also be flanked by two 30-inch WQXGA monitors for a 6320 × 1600 composite image with an 11.85:3 (79:20, 3.95:1) aspect ratio. Some WQXGA medical displays (such as the Barco Coronis 4MP) can also be configured as two virtual 1200 × 1600 or 1280 × 1600 seamless displays by using both DVI ports at the same time. In 2010, WQXGA made its debut in a handful of home theater projectors targeted at the Constant Height Screen application market. Both Digital Projection Inc and projectiondesign released models based on a Texas Instruments DLP chip with a native WQXGA resolution, alleviating the need for an anamorphic lens to achieve 1:2.35 image projection. Many manufacturers have 27–30-inch models that are capable of WQXGA, albeit at a much higher price than lower resolution monitors of the same size. Several mainstream WQXGA monitors are or were available with 30-inch displays, such as the Dell 3007WFP-HC, 3008WFP, U3011, U3014, UP3017, the Hewlett-Packard LP3065, the Gateway XHD3000, LG W3000H, and the Samsung 305T. Specialist manufacturers like NEC, Eizo, Planar Systems, Barco (LC-3001), and possibly others offer similar models. As of 2016, LG Display make a 10-bit 30-inch AH-IPS panel, with wide color gamut, used in monitors from Dell, NEC, HP, Lenovo and Iiyama. Released in November 2012, Google's Nexus 10 is the first consumer tablet to feature WQXGA resolution. Before its release, the highest resolution available on a tablet was QXGA (2048 × 1536), available on the Apple iPad 3rd and 4th generations devices. Several Samsung Galaxy tablets, including the Note 10.1 (2014 Edition), Tab S 8.4, 10.5 and TabPRO 8.4, 10.1 and Note Pro 12.2, as well as the Gigaset QV1030, also feature a WQXGA resolution display. QSXGA (Quad Super Extended Graphics Array) is a display resolution of 2560 × 2048 pixels with a 5:4 aspect ratio. Grayscale monitors with a 2560 × 2048 resolution, primarily for medical use, are available from Planar Systems (Dome E5), Eizo (Radiforce G51), Barco (Nio 5, MP), WIDE (IF2105MP), IDTech (IAQS80F), and possibly others. Most display cards with a DVI connector are capable of supporting the 3840 × 2400 resolution. However, the maximum refresh rate will be limited by the number of DVI links which are connected to the monitor. 1, 2, or 4 DVI connectors are used to drive the monitor using various tile configurations. Only the IBM T221-DG5 and IDTech MD22292B5 support the use of dual-link DVI ports through an external converter box. Many systems using these monitors use at least two DVI connectors to send video to the monitor. These DVI connectors can be from the same graphics card, different graphics cards, or even different computers. Motion across the tile boundary(ies) can show tearing if the DVI links are not synchronized. The display panel can be updated at a speed between 0 Hz and 41 Hz (48 Hz for the IBM T221-DG5, -DGP, and IDTech MD22292B5). The refresh rate of the video signal can be higher than 41 Hz (or 48 Hz) but the monitor will not update the display any faster even if graphics card(s) do so. In June 2001, WQUXGA was introduced in the IBM T220 LCD monitor using a LCD panel built by IDTech. LCD displays that support WQUXGA resolution include: IBM T220, IBM T221, Iiyama AQU5611DTBK, ViewSonic VP2290, ADTX MD22292B, and IDTech MD22292 (models B0, B1, B2, B5, C0, C2). IDTech was the original equipment manufacturer which sold these monitors to ADTX, IBM, Iiyama, and ViewSonic. However, none of the WQUXGA monitors (IBM, ViewSonic, Iiyama, ADTX) are in production anymore: they had prices that were well above even the higher end displays used by graphic professionals, and the lower refresh rates, 41 Hz and 48 Hz, made them less attractive for many applications. Ultrawide formats, History & comparison of video formats & displays, which are growing wider. ^ Ahmed, Asif (13 November 2017). "18:9 Aspect Ratio in Smartphones will be the new Standard in 2018, Here's why". Techtippr. Retrieved 2018-10-01. ^ Villas-Boas, Antonio (12 June 2017). "Playing games on Samsung's massive new computer monitor and other ultra-wide monitors gives you an advantage". Business Insider Singapore. Retrieved 2018-10-01. ^ "DVCPRO HD Format Specifications". Apple. Archived from the original on 2010-02-16. Retrieved 2018-10-01. ^ a b "Digital Cinema System Specification" (PDF). Digital Cinema Initiatives. 10 October 2012. Archived from the original (PDF) on 2016-05-27. Retrieved 2016-03-02. ^ Bhagat, Hitesh Raj; Bajaj, Karan (26 January 2018). "The 18:9 display dilemma: Will the new smartphone screens make our lives easier or do the opposite?". The Economic Times. Bennett, Coleman & Co. Retrieved 2018-10-01. ^ "ASUS PB278Q 27-Inch WQHD LED-lit PLS Professional Graphics Monitor". Amazon. Retrieved 2013-05-22. ^ McGuigan, Brendan (2013). "What Is 1440p? (with picture)". wisegeek.com. Retrieved 2013-12-10. ^ Lawler, Richard (17 October 2006). "CMO to ship 47-inch Quad HD – 1440p – LCD in 2007". Engadget. Retrieved 2008-07-06. ^ "CMO showcases latest "green" and "innovative" LCD panels". Chi Mei Optoelectronics. 24 October 2008. Archived from the original on 2010-03-13. Retrieved 2008-10-26. ^ Davies, Chris (1 September 2012). "Samsung Series 9 WQHD: Hands-on with Sammy's Retina retort". SlashGear. Retrieved 2013-06-02. ^ Santos, Alexis (20 August 2013). "LG Display claims a world's first with 2,560 × 1,440 LCD for smartphones". Engadget. AOL. Retrieved 2013-08-21. ^ Lai, Richard (16 October 2013). "Vivo Xplay 3S to be the world's first phone with a 2,560 x 1,440 display". Engadget. AOL. Retrieved 2013-10-19. ^ "Samsung Galaxy Note 4". GSMArena. Retrieved 2018-10-01. ^ "Android: Be together. Not the same". Google Official Blog. Google. 15 October 2014. Retrieved 2015-02-14. ^ "Nexus 6 from Google and Motorola: More Android. More screen. More everything". The Official Motorola Blog. Motorola. 15 October 2014. Retrieved 2015-02-14. ^ "Nexus 6". Google. Archived from the original on 2015-02-16. Retrieved 2015-02-14. ^ Kelion, Leo (1 March 2015). "Samsung S6 Edge with curved screen unveiled at MWC". BBC News. Retrieved 2015-03-01. ^ "Samsung Galaxy S7 - Full phone specifications". GSMArena. Retrieved 2018-10-01. ^ Brian, Matt (20 May 2013). "Samsung beats Chromebook Pixel and Retina MacBook with new high-res laptop display". The Verge. Retrieved 2013-05-23. ^ Nistor, Codrut (21 October 2013). "Dell XPS 15 now features a QHD+ resolution display". Notebookcheck. Retrieved 2013-11-15. ^ "LG UltraWide QHD IPS Monitor 34UM95". LG Electronics UK. Retrieved 2016-09-07. ^ Hollister, Sean (23 May 2013). "HP redesigns Envy and Pavilion laptops for 2013, including one with a 3200 x 1800 screen". The Verge. Retrieved 2013-05-23. ^ Sakr, Sharif (20 May 2013). "Samsung to exhibit 13.3-inch notebook display with 3,200 x 1,800 resolution". Engadget. Retrieved 2013-05-23. ^ Addison, Ken (17 May 2018). "Samsung C49HG90 49-in Ultrawide FreeSync 2 Monitor Review: How Wide is too Wide?". PC Perspective. Retrieved 2018-10-01. ^ "38" Class 21:9 UltraWide® WQHD+ IPS Curved LED Monitor (37.5" Diagonal)". LG Electronics. Retrieved 2017-12-30. ^ "XR382CQK bmijqphuzx". Acer. Archived from the original on 2017-12-30. Retrieved 2017-12-30. ^ Singleton, Micah (14 June 2017). "Dell U3818DW". The Verge. Vox Media. Retrieved 2018-01-12. ^ Thacker, Jim (17 September 2017). "HP Z38c". CG Channel. Retrieved 2018-01-12. ^ a b "UHDTV Ecosystem Reference Diagram" (PDF). SMPTE. Retrieved 2018-05-15. ^ a b "Ultra High Definition Television: Threshold of a new age" (Press release). ITU. 24 May 2012. Retrieved 2012-08-18. ^ a b "Recommendation ITU-R BT.2020-2 — Parameter values for ultra-high definition television systems for production and international programme exchange" (PDF). International Telecommunication Union (ITU). October 2015. Retrieved 2018-05-15. ^ a b "Phasing in Ultra High Definition" (PDF). Digital Video Broadcasting (DVB). February 2017. Retrieved 2018-05-15. ^ "CEA Updates Characteristics for Ultra High-Definition Displays". Consumer Electronics Association (CEA). 24 June 2014. Retrieved 2018-05-15. ^ Philippides, Alexis (17 April 2012). "What are 4K, QFHD and Ultra HD resolutions?". Stuff-Review. Retrieved 2018-05-15. ^ Malik, Haroon (9 January 2008). "Concept Samsung 82-Inch LCD World's Largest Ultra High-Definition". Gizmodo. Retrieved 2013-05-22. ^ "Sony Announces TRIMASTER SRM-L560 HDTV". HDTV Review. 6 October 2009. Archived from the original on 2016-03-15. Retrieved 2016-01-07. ^ Hannaford, Kat (25 May 2010). "LG Shows Off 84-Inch 3DTV With 3,840 x 2,160 Resolution". Gizmodo. Retrieved 2013-05-22. ^ "27.8" (R278D1)". Chimei Innolux. Archived from the original on 2011-01-04. Retrieved 2010-12-27. ^ "Toshiba's REGZA 55x3 announced as world's first 4K2K TV with glasses-free 3D". Engadget. AOL. Retrieved 2013-05-22. ^ Wiley, Craig. "4K Ultra HD Displays: What You Need to Know". DisplayPort. VESA. Retrieved 2013-08-13. ^ a b "FAQ for HDMI 1.4 : Support for 4K format". HDMI Licensing. Retrieved 2013-08-13. ^ a b "FAQ for HDMI 2.0". HDMI Licensing. Retrieved 2014-01-09. ^ "4K Ultra High Resolution Development". NVIDIA Developer Zone. NVIDIA. Retrieved 2013-12-17. ^ Shrout, Ryan (19 July 2013). "ASUS PQ321Q 31.5-in 4K 60 Hz Tiled Monitor Review". PC Perspective. Retrieved 2016-01-07. ^ "PB287Q 4K For The Masses – CES 2014". ASUSTek. Archived from the original on 2014-09-21. Retrieved 2014-08-20. ^ Shrout, Ryan (9 May 2014). "Video Perspective: Samsung U28D590D 28-in 4K Single Stream 60 Hz Monitor Review". PC Perspective. Retrieved 2016-01-07. ^ "Sony Xperia Z5 Premium specs". phoneArena.com. Retrieved 2016-02-08. ^ "Xperia™ XZ Premium". Sony Mobile. Retrieved 2018-10-01. ^ "LG 31MU97-B: 31 Inch 4K IPS Monitor". LG. Retrieved 2016-03-02. ^ "Distributing 4K and UHD Signals in Professional AV Environments" (PDF). Extron. 2 March 2014. Retrieved 2016-01-07. ^ Humphries, Matthew (29 July 2014). "Forget 4K, LG ships a 105-inch 5K TV". Ziff Davis. Retrieved 2018-05-29. ^ Shilov, Anton (23 July 2014). "Samsung prices its 105" 5K UHD curved TV: $120,000". Kitguru. Retrieved 2018-05-29. ^ Shilov, Anton (28 December 2017). "LG Announces the 5K UltraWide 34WK95U: A 'Nano IPS' Monitor with a HDR600 Badge". AnandTech. Purch. Retrieved 2018-05-29. ^ "LG 34BK95U: 34 Inch Class 21:9 UltraWide® 5K2K Nano IPS LED Monitor w/ HDR 600 | LG USA". LG Business Solutions. LG. Archived from the original on 2019-02-08. Retrieved 2019-02-08. ^ "Issues users need to understand when using UHD (4K x 2K) and UHD+ (5K x 3K) displays (Text and icons are too small etc.)". Dell. Retrieved 2016-01-06. ^ Anthony, Sebastian (5 September 2014). "Dell unveils 5K desktop monitor with almost 2x the pixels of your puny 4K display". ExtremeTech. Ziff Davis. Retrieved 2014-10-19. ^ "Apple Special Event. October 16, 2014". Apple. Retrieved 2014-10-19. ^ Bonnington, Christina (17 October 2014). "Answers to All of Your Questions About Apple's 5K iMac Display". Wired. Condé Nast. Retrieved 2014-10-19. ^ Chester, Edward (5 October 2015). "Dell UltraSharp UP2715K". TrustedReviews. Retrieved 2016-01-06. ^ Smith, Ryan (16 September 2014). "VESA Releases DisplayPort 1.3 Standard: 50% More Bandwidth, New Features". AnandTech. Purch. Retrieved 2016-01-06. ^ "VESA Publishes DisplayPort™ Standard Version 1.4". DisplayPort. Retrieved 2016-03-19. ^ "QVGA (Quarter Video Graphics Array)". Tech-FAQ. Independent Media. Retrieved 2010-02-10. ^ June, Laura (24 November 2008). "Optoma DLP Pico projector "coming soon" to US". Engadget. AOL. Retrieved 2008-11-24. ^ "Screen compatibility overview". Android Developers. Google. Retrieved 2011-02-04. ^ Polsson, Ken (9 November 2010). "Chronology of IBM Personal Computers". Archived from the original on 2011-06-07. Retrieved 2010-11-18. ^ "New resolutions for Microsoft Smartphone (320x240) and Pocket PC (640x480) are coming". MS Mobiles. 28 October 2003. Archived from the original on 2003-10-29. Retrieved 2013-05-22. ^ "NVIDIA Tegra FAQ" (PDF) (FAQ). Nvidia. Retrieved 2013-05-22. ^ "Ultra Video Graphics Array (UVGA)". Smart Computing Encyclopedia. Smart Computing. 16 January 2007. Archived from the original on 2012-02-25. Retrieved 2014-03-12. ^ Verma, Vipul (29 October 2001). "Same monitor yet better viewing". The Tribune. Retrieved 2008-03-26. ^ Necasek, Michal. "The XGA Graphics Chip". The OS/2 Museum. Retrieved 2013-08-01. ^ Necasek, Michal. "The 8514/A Graphics Accelerators". The OS/2 Museum. Retrieved 2013-08-01. ^ IBM 3270 Workstation Program User's Guide and Reference (PDF). International Business Machines Corporation. 1987. p. GL-17. Retrieved 2014-01-23. ^ "Plasma TVs" (PDF). Hitachi. Archived from the original (PDF) on 2007-10-09. Retrieved 2013-05-22. ^ "TV Panels Standard" (PDF). VESA. 10 March 2006. Archived from the original (PDF) on 2008-12-09. Retrieved 2013-05-22. ^ "VESA Asia Briefings" (PDF). VESA. October 2005. p. 21. Archived from the original (PDF) on 2005-12-15. Retrieved 2013-05-22. ^ "LEARN MORE LCD Displays". Dell. Retrieved 2013-05-22. ^ "Help Me Decide". Lenovo. Archived from the original on 2014-01-02. Retrieved 2013-05-22. ^ "Acer PH530 HDTV DLP Projector". NCIX. Archived from the original on 2012-04-29. Retrieved 2013-05-22. ^ "Renesas Technology Releases R8J66730FP Liquid Crystal Panel Timing Controller Incorporating Overdrive Function for Improved Moving Image Display Capability and Color Conversion Function" (Press release). Renesas Technology. 12 September 2005. Archived from the original on 2006-03-22. Retrieved 2013-05-22. ^ "SPWG Notebook Panel Specification" (PDF). Standard Panels Working Group. 14 March 2007. p. 18. Archived from the original (PDF) on 2012-04-24. Retrieved 2013-05-22. ^ "Introduction". Monitor Technology Guide. NEC Display Solutions. Archived from the original on 2007-03-15. Retrieved 2013-05-22. ^ "Apple unveils new iPad with high-definition screen". BBC. 8 March 2012. Retrieved 2012-03-07. ^ "ViewSonic Brings World's Highest Resolution Monitor To Its LCD Lineup" (Press release). ViewSonic. 25 June 2002. Archived from the original on 2002-12-07. Retrieved 2013-05-22. ^ "About Purchase of the Ultra High-Resolution and Ultra High-Density LCD Monitor". IDTech. Archived from the original on 2004-04-05. Retrieved 2013-05-22.